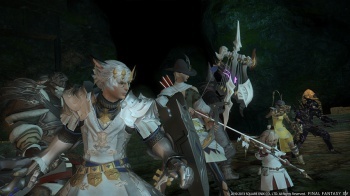 Square Enix's MMORPG Final Fantasy XIV: A Realm Reborn also won a newly created award at this year's PlayStation Awards. Final Fantasy XIV: A Realm Reborn will launch on the PS4 in April 2014, Square Enix revealed today at the PlayStation Awards. The MMORPG enters beta for the PS4 version on Feb. 22, the same day the PS4 launches in Japan. A Realm Reborn also received the "Special Award" at the PlayStation Awards. The award was created this year to "recognize outstanding titles on the overall combination based on the following attributes: originality, buzz-worthiness, influence, and performance." Players on the PS3 version can upgrade to the PS4 version and transfer character and save data for free. The PS3 version is on sale for $10 for PS Plus members as a part of the PlayStation Store Holiday Sale's first week. Producer and director Naoki Yoshida will show off the PS4 version of A Realm Reborn in a live broadcast called "Letter from the Producer LIVE" on Dec. 14 at 7 a.m. ET. The video will also include content from patch 2.1 update, which launches Dec. 17, and remote play using the Vita. The patch includes "The Wolves' Den," "Treasure Hunting," and "Daily Beast Tribe Quests." For information on the broadcast, where to watch it, and how to submit questions, visit the Lodestone. Final Fantasy XIV: A Realm Reborn launched worldwide on Aug. 27 for PS3 and Windows PC. The launch was shaky thanks to server problems, but Square Enix has stated the game has been very successful with over 1.5 million users and revised its financial predictions for the better thanks to the MMORPG.